We have been waiting to see what the newest Furby would look like and now we don’t have to wait any longer. Introducing the newest Furby Boom Crystal Series. These Furbies come from deep within the crystal caves of Furby Island and have all the cool features that you would expect from Furby. We all know there are great things at the end of the rainbow but a Furby is just about one of the coolest things we would hope to find! The Furby Boom Crystal Series Rainbow edition will start to arrive in stores about September 22 and we can wait to see them. 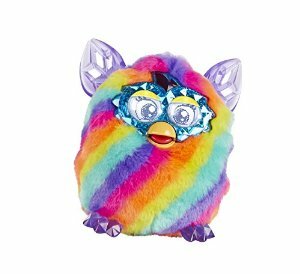 This Rainbow pattern has rainbow stripes around the body with the cool crystal eye mask, ears and feet. The Furby is far out and the kids are going to love this! The population is booming because Furby Boom can hatch more than 50 virtual Furby Furblings eggs! Collect virtual eggs in the free Furby Boom app by taking care of your Furby Boom, getting them from friends with Furby Boom, and even by finding them. Can you hatch enough virtual Furblings to fill the towers of your city and get the golden egg? As you collect and hatch virtual Furblings eggs, your digital city fills up with virtual Furblings that you and your Furby Boom can interact with.Team up with your Furby Boom and your virtual Furblings to play games in the app such as Furball, the Furbish version of soccer. Between taking care of your Furby Boom and raising virtual Furblings, the Furbish fun goes on and on! Raise Digital Furblings With Your Furby Boom App. When you play with your Furby Boom creature using the free Furby Boom app, you can unlock the complete game experience. Give your Furby Boom a name using the app – your Furby Boom will remember it and the names of other Furby Boom creatures it meets! Keep track of your Furby Boom creature’s health, hunger, and cleanliness levels using the app’s monitor. Time for a checkup? Try X-raying Furby Boom. Is Furby Boom hungry? Grab a snack from the app’s pantry. Need to freshen up? Give Furby Boom a virtual shower! When you take care of your Furby Boom, it becomes ready to take care of something too – that’s when you get a virtual Furby Furblings egg! (Furby Boom app features only available for Furby Boom product. We have been waiting to see what the newest Furby would look like and now we donâ€™t have to wait any longer. Introducing the newest Furby Boom Crystal Series. These Furbies come from deep within the crystal caves of Furby Island and have all the cool features that you would expect from Furby. We all know there are great things at the end of the rainbow but a Furby is just about one of the coolest things we would hope to find!